While some of the world continents like Eastern Asia are taking rice as their staple food, it also happens to be one of the foods you can never lack anywhere. In every market, households, and farm, rice is always the talk due to its flexibility. The Japanese have gone an extra mile to turn the opportunities brought about by rice into science and money making project. They are the pioneers when it comes to manufacturing rice cookers. The fascinating thing is that Japan is known to be quality oriented manufacturers for improved performance in the kitchen. Therefore, the best Japanese rice cookers will not disappoint any enthusiastic chef or housewife who knows how vital kitchen appliances ought to be. Without further ado let us take you through some of the best Japanese rice cookers. Why Should You Buy A Japanese Rice Cooker? Japanese are well known for quality, and they will pay attention to design something that will outshine the rest. Starting with cars to skyscrapers and eventually to rice cookers! Comparatively, rice being their staple food, they do pay attention to manufacturing a kitchen appliance that will forever be your cooking mate. Also, they not only care for Japanese consumers alone. They have in mind the rest of the world while producing a rice cooker of standard quality, universally accepted both to those using imperial measures and those who don’t. These Japanese cookers come in metric measures making more effective to be used and distributed worldwide. The list of these rice cookers can never end. However, we have sampled the top in the market and those that will not hurt your pocket. By the end of this article, you will be assured of coming across one cooker that will be ideal for you. Let us then get started! When you want comfort, versatility, and efficiency to operate, this particular kitchen appliance will perfectly fit due to its average small size and super quality. It features a micro computerized fuzzy logic technology with a maximum of up to 5 ½ cups with a 1-liter dimension. It also features a retractable power cord for easy storage. Besides, it is easy to clean, has stainless steel clear exterior and also an automatic keep warm. The “keep warm” feature is an extended “keep warm” and reheating features meaning, even if your food is cold it can be warmed automatically. Interestingly, it has a multi-menu setting such as sushi, porridge, mixed, cake, brown, steam, sweet and fast cooking. This allows cooking vegetables and other food fast and in a healthy manner. ​Other than rice can be used to cook vegetables. ​It has a micro computerized fuzzy logic technology. Comes with automatic keep warm, extended “keep warm” and reheating features. This rice cooker comes with a simple and easy to operate single switch control with see-through glass. It also has a stay cool knob to give you a perfect cooking experience. You can easily monitor your cooking process. Again, it makes it easy to transport food by keeping it cool. The stainless steaming tray ensures the cooker is free from corrosion and has a capacity of up to 3 cups. Furthermore, it has an automatic “keep warm” function enabling your rice to remain warm for long after cooking. It is also a conventional rice cooker as it automatically cooks your rice and switches off when cooking is done. This makes it an ideal appliance even for those who are not qualified to be a chef. Other accessories it comes with are rice measuring cups and a nonstick rice spatula. If you are someone who gets fascinated with technology and loves devices that are easy to use, the tiger JBA rice cooker is your product. The results will definitely wow you. It features a 3-in 1 technology which involves slow cooker, steamer, and a multi-menu rice cooker ideal for porridge, sweet, brown, multi-grain, plain, mixed and quick rice, steam, and slow cook. Plus, coupled with a minimal preparation by just a press of a button. Moreover, it features tiger's automatic logic system which constantly monitors cooking temperature for you to having a flawless meal. Further, it has a capacity of 5 ½ cups, automatic “keep warm” function after the rice has been cooked, removable and easy to clean inner lid and steam cap. Other highlights include easy to view and read LCD control panel and a delay timer. Make the most perfect moment with your small family, couple or even friends using this ideal cooking appliance. It stands out to be unique and distributed worldwide to give you the tastiest and delicious rice ever. With a 3-cup capacity, this cooker can make up to six cups of cooked rice. It is also of a simple design yet attractive and appealing to improve the overall look of your kitchen. The cooker is again relatively of a small size hence requires less storage space. Its topmost features are; automatic and extended “keep warm” settings, built in retractable power cord, 2 settings delay timer, detachable inner lid, reheating function and an easy to view LCD panel. Other additional accessories include measuring cup, spatula holder and a nonstick rice spatula. Also, it gives you better cooking experience with measuring line for accurate control of ingredients due to the inner cooking pan it comes with. Aroma is amongst the number one brand for rice cookers in the worldwide. It is so versatile that it can be used to serve medium-sized families and a fairly large group of friends who might come along visiting. It has a special function for white and brown rice with a generous capacity accommodating 4-20 cups. The cooker guarantees you enjoy your rice due to its slow cooking feature that ensures your food is rich, tasty and more delicious. Further advantage is that it is a time-saving appliance acting as a meal making powerhouse. This means you can steam meat and vegetables while your rice boils below. Other highlights comprise 15-hour time delay settings for flexible meal planning dimensions with easy to operate programmable digital control. Also, it has an automatic keep warm, brown and white rice steaming function and a slow flash rice features. 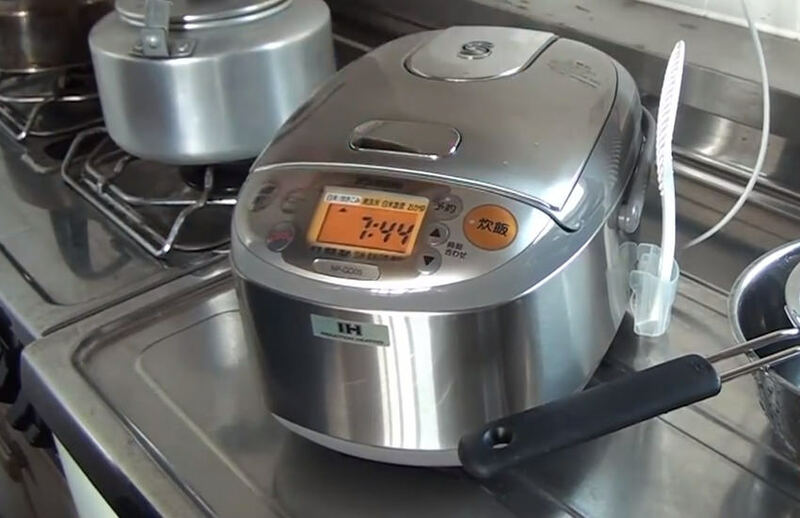 This particular rice cooker has some unique feature, making it arguably one of the best in the market. Even though this rice steamer comes along with a micro-computer technology with a capacity of 5 ½ cups uncooked rice, it also features a unique function of induction heating system ensuring even heat distribution for perfect cooking time. Furtherly, it gives you an option to choose an array of cooking options from mixed rice, white rice, sweet rice, sushi rice, porridge, and quick cooking. Also, it features a signaling interchangeable melody and beep indicating the cooking cycles. It comes with clear coated stainless steel that is easy to clean. Additionally, the health benefits of this appliance are that it has cooking options even for germinated brown rice, GABA brown rice, and brown rice. Other features include that it can be detachable and has a washable inner lid with an easy-to-read LCD control panel. If you really embrace MICOM technology, then go for one of its cooking appliances. They have continued making quite an exception in the market due to the uniqueness in the functionality of their products. It’s also imperative to mention that this rice cookware has a microchip that basically does most of the cooking for you. You only need to plug in, add water relax and wait. Amazingly, it will do all the timing and regulating cooking temperatures. Further, depending on the type of rice, the cooker will time the pre-soaking of raw grains. Consequently, it has a 3cup capacity that makes up to 6 cups of cooked rice. The Multi-cooking functions enable a wide range of cooking from white and brown rice, sushi, mixed porridge, and rapid cooking. Again, the inner cooking pan enables evenly heating and gauging lines for accurate governing of ingredients. Doesn’t have stay cool knob. Tiger brands are known to manufacture quality rice cookware that is easy to use. Importantly, you are guaranteed the best performance and outcomes as the product is of top-notch quality. They have an amusing and appealing outward design that can easily match any kitchen décor. Consequently, it has an extended warm function of up to twelve hours with a nonstick inner pan for efficient serving and even cleaning. Again, it has a capacity of 51/2 cups and comes along with spatula and rice measuring cups. Additionally, it's easy to maintain since the steam vent comes detachable and easily washable. In addition, for easy storage and less damaging, it has a retractable power cord and automatically switches to “keep warm” setting after cooking has been completed. Panasonic is known when it comes to guaranteeing you quality and comfort while preparing you delicious rice. With a keen design of the counter top appliance, it comes along with a 24 hour preset timer, which makes it possible to come home from work and still find your meal ready and hot. After cooking, it automatically switches to “keep warm” mode at an ideal temperature. Other pertaining features is the advanced fuzzy logic technology which adjusts power and cooking time automatically for an accurate cooking option. A further advantage, it has 8 preprogram control panel to give you 8 options of preprogramming cooking and reduced risk of being burned with a hot lid by avoiding manual removal of the lid. You just push a button to release the lid. Also can cook up to 10 cups of quality restaurant rice. This premium induction heating pressure rice cooker brings the modern outlook to a higher degree. With a glistening top coating and rounded edges, it gives the rice cooker that glossy look. The product comes with both inside and outside having a removable covering with a stainless steel coating. This makes it a fast, healthier, easy to clean and nutritious cooker. Also, it’s fitted with a double layer covering, 10cup diashield inner pot, and voice navigation that have the option of speaking Korean, English, and Chinese. The manual has all the cooking functions you will ever need. Other highlights are, fuzzy logic technology and intelligent cooking algorithm for accurate and consistent results anytime you cook with it. Additionally, it has a water drainage system when there is excess water for better cooking results, auto steam clean and a cuckoo multi cooker. All this enables one to have a diversity of cooking styles to choose from the cooking functions. Depending on how you want to use the rice cooker, there are different types in the market, from a simple one to a programmable rice cooker with advanced features for convenient cooking. The choice is yours. Go for the versatile one as they provide a wide range of cooking options. However, if you want a particular kind of cooking, you will not lack one. It's good to note that, not all rice cooker will provide the most ideal induction heating system. However, a few manufacturers have specialized in making rice cookers such as Zojirushi NP-HBC10 5-1/2 to have a fine heat distribution for efficient cooking. Go for what suits you need. The quality rice cooker will also come with a multi-function setting to enable you to choose from a variety of options such as quick rice, white and brown rice, and even sushi rice. It is important to go for those with this kind of feature as you are likely to save not only money but also space in the kitchen. Depending on the size of your family, most of this appliances will have a capacity ranging from at least 3 cups to 6 cups of cooked rice. But the highest in this review is ranging from 4-20 cups capacity. Capacity will be determined by the purpose. Depending on the intended use of the cooker, go for what will fit the purpose. It will be so costly to purchase an electric appliance whose power consumption is very high. Most of the brands in this review are considered ideal energy savers. Any of them will guarantee proper usage of electricity. Going for something simple and easy to use will guarantee you ample time while cooking. However, due to improved technology, the majority are programmable thus doing most of the cooking for you. Yours is to do the basic parts such as adding water and pressing the button. Reheating your food each and every time after cooking is time-consuming, especially when you are in a hurry or starving. However, a majority of this cookware automatically switches to “keep warm” mode. Letting your food stay warm and delicious even after cooking is done. Most of the reviewed products have this feature. Every chef will agree with me that, dimensions are very essential for cooking rice. In that case before considering to purchase, understand the dimensions the rice cooker will come with. Make sure the dimensions are either metrics or imperial for you to have precise control of your ingredients when cooking. If you've noticed from the review, most of the best brands of Japanese rice cookers are featured with a stay cool knob, and they are usually ideal when used for transporting food after cooking. For that reason, you won't go for some that are quite heavy, but instead, something light. This also can be easily carried within the house. Q. Why Should I Use A Rice Cooker To Cook Rice? A. Because it is the most efficient and time serving electronic kitchen device, used to simmer rice to give the perfect results in cooking rather than using a stove whose burner can’t be lowered for the perfect heat for simmering. Q. Can I leave my cookware unattended? A. Modern rice cooker comes with a stay-warm function to keep your food warm even while you are not around. Although it’s not safe to leave it unattended for long. Q. Will the rice cooker know when the rice is ready? A. Rice cooker thermal sensor, will detect when water has been fully absorbed, at that point, rice is ready. Consequently, it will trigger the shutoff switch and afterward “keep warm” feature will commence. Q. Can I steam even vegetables using a rice cooker? A. Yes, modern rice cookers will steam your vegetables fast, and you won't use much time and effort. Q. Does rice cooker cook rice very fast? A. It cooks in very high temperatures that enable rice to absorb water fast and cook quickly to produce something delicious. Well, slowly but sure enough we've reached the end of our review, the list has some wonderful rice cookers, and I believe, you have made up your mind now onto which kind of the best Japanese rice cooker will be ideal for you. Besides, this rice cookware comes in different sizes varying in brands and technology used to make them stand out to be among the best. Apart from just cooking rice, some come with handy features to be also used in cooking other food, otherwise, improving the efficacy of cooking. Go for what fits your need and pocket.